This book highlights the importance of software engineering in game development. It does so with a sufficient amount of facts based on the author's experiences. Brent also shared the constraints working in indie vs. mainstream developers, e.g., indie developers have more latitude as to the genre and content of their games. This will help those considering a career as game designers based on their personality. This doesn't mean that creativity and innovation are 'dead' in mainstream developers, it just means that creativity and innovation are limited by boundaries set by top management. Those with formal software engineering backgrounds will find the familiar disciplines needed to make game development efficient: planning, communicating with those involved; unbiased assessments of work in progress by 3rd parties, prioritization of requirements (features/functionalities), version control, etc. What I liked about the book is that it also introduces Kaizen (continuous improvement). While there are formal lessons learned meetings where formal improvements are uncovered, Brent encourages personal improvements as well such as playing games you don't necessarily like or by a competitor, reading books (that may or may not be related to work), learning new skills, or just taking a well deserved vacation to clear one's head. I have seen so many engineers burn out because there are no 'rest and relaxation' in between projects. Neuroscientists have already proven the benefits of taking short breaks and most of all, a good night's sleep in maintaining performance. What I'd like to see improved in future editions: (1) Provide a bird's eye view of the game development pipeline and the elements making up and supporting the pipeline via an illustration. I assume though that this pipeline is similar to the life cycles in other disciplines, e.g., sprints (Scrum). (2) Better proofreading (some minor spelling and grammatical mistakes). 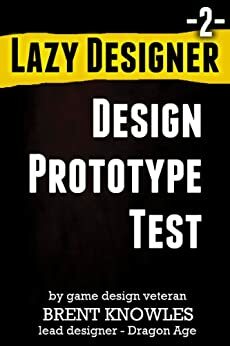 I recommend this book to new game designers or to indie game developers who find their development work chaotic. This book will point you in the right direction in terms of the processes and people (project managers, database experts, technical writers) you need. Brent has another great book here with Design Prototype and Test. I recently started trying to figure out what it takes to even just build a game. I have found Brent's books to be easy to read, concise but fairly explicit and with plenty of inside knowledge form the industry to help avoid pitfalls. If you're looking to build, design or help plan a game, Brent's books are awesome! No fluff. To the point. This is a great introductory series on how to be a game designer. I only wish Knowles would hurry up and finish the next one. Brent Knowles combines a decade of experience with game design at BioWare, and his passion for writing to bring us the second installment in his Lazy Designer Game Design series. How To Make The Next Game. While I wouldn't call this the Bible of Game Design, Brent's knowledge in the field will appeal to both novice and seasoned designers alike. We are presented with information on the various stages one will encounter in the process. What I personally like about this author is that he doesn't present with an air of superiority. In fact it is quite the opposite. He invites us to engage and share with him. I'm sure we will see many gems from Brent in the years to come. 5.0 out of 5 starsEven I Could Do It! I'm not planning on creating games, but I did take a look at what Brent Knowles had to offer in his Lazy Designer Design Prototype and Test two-part book on how to make the next game. It was written so a novice could understand what steps were necessary in what order to accomplish the goal. What amazes me is the thorough, well-written information you get for $3.99. It's not a big decision and you certainly won't regret it.